When it was announced that Stephen King's IT would be getting the reboot treatment, the reaction was not very positive. However, as more images and footage was released, the film soon became highly anticipated by many. After a lackluster end to the summer of 2017, 'IT' looked to provide the quality missing in the last month. Thankfully, 'IT' delivers making it one of the best horror remakes in recent years. Every 27 years, an evil presence Pennywise haunts and torments the children of Derry. It's latest victims are the Losers Club, a group of misfit kids who are already targeted by the neighbourhood bullies. Over the summer IT will look to bring these kids fears to life and feast on the children themselves. Recreating a story using an iconic horror villain is never an easy task - ask 2010's 'A Nightmare On Elm Street' or Rob Zombie's 'Friday the 13th' - as no matter what, the film will be compared with its predecessor. This version of Stephen King's classic horror novel isn't a direct adaptation, changing from a mini series to a film format with some changes to make it different and stand on its own. The characters - in this case, Pennywise in particular - will be compared due to the great performances in the past series. Tim Curry's portrayal of Pennywise is instantly recognisable and brought great fear to audiences across the world. Bill Skarsgard would be challenged with improving on an already beloved character. With a new look and a bag full of new tricks, Skarsgard does just as good a job as Curry did back in 1990. Anyone with a fear of clowns will not be able to sleep easy at night after seeing the latest incarnation of Pennywise. Skarsgard provides a creepier version of the shapeshifter that uses more psychological torture and wild antics to mess with his prey rather than using his own moniker entirely. The Swedish actor goes all out, fully committing to the character in every scene, a particular highlight being when he torments Eddie Hasbrek for the first time at the Well House. This new Pennywise is very different to many of the recent clown characters we have seen as it takes a fairly childish approach to some antics which is close to being fairly silly. However, it knows when to push it at the right time in order to get as much effect as possible. With this adaptation happening 27 years after the original, the film is able to do a lot more and be creative using CGI. The practical effects are gone with a lot of CGI replacing to try and recreate the thrills and scares. At times, this was quite excessive making the effects look very fake which in hand made some moments a whole less scary. This is the one factor of the film that did disappoint. The use of CGI is very apparent in many scenes which take you out of the world that has been so masterfully created throughout the film. This problem seems to be very apparent in modern horror films - 'The Conjuring' Universe is a big criminal of this - and it is no different with 'IT'. 'IT' also falls victim to using an extremely loud noise to accompany a "scary" moment. This really doesn't help as it doesn't add anything to the scene, it might shock you at first because a loud noise went off but that is it. Some of the best scares were also in the trailer which has been playing non-stop which has caused these moments to lose some effect. Although the film creates a tense and creepy atmosphere, I never really felt scared by anything that was happening. Maybe the pre release buzz and my expectations for the film set the bar too high but I have to say, this aspect sort of disappointed me. Despite the scares not working at every moment, there is plenty to enjoy and that is mainly down to the cast of kids playing The Losers Club. There is a 'Goonies' vibe to this group of unpopular kids who are a complete joy to watch. There is so much personality in this group which makes every scene enjoyable and never leaves a dull moment. As someone who really enjoys a good coming of age story, I found myself enjoying the friendship of this group just as much and even more so than the horror aspect most of the time. Finn Wolfhard is the stand out for me as Richie Tozier, the loud trash talker who steals every scene with his quick wit. He bounces off each character fantastically well showing that he is capable of providing great comedy. The whole gang are great and really carry this film themselves due to their being very little screen time for the adult characters. In saying this, some of the characters are left with little to do in the film, especially Mike and Stanley. Mike, in particular, is robbed of his main role as it is delegated to another character, leaving him with little to do for most of the film. This does make some of the characters feel much less important than the others. There is plenty of depth given to each character in the Losers Group as well as their main bully Henry Bowers. We get to see each character's background and own personal story that really helps builds each person as an individual. This creates so many layers for the characters and allows the film to create many creepy and eery scenes for each specific character. The use of these characters is fantastic as no detail really feels unnecessary as the film capitalizes on almost everything it sets up. The script is incredibly strong as it succeeds in making you really care for and take an interest in all of the characters. The first part of the mini-series was the most enjoyable due to the group of children and that has transcended into the feature film and the script deserves huge praise for this. It's a rarity to see such graphic violence to children, even in horror films but 'IT' certainly does not hold back in these moments. This helps the film go much darker at times and create an everlasting impact on the viewer. 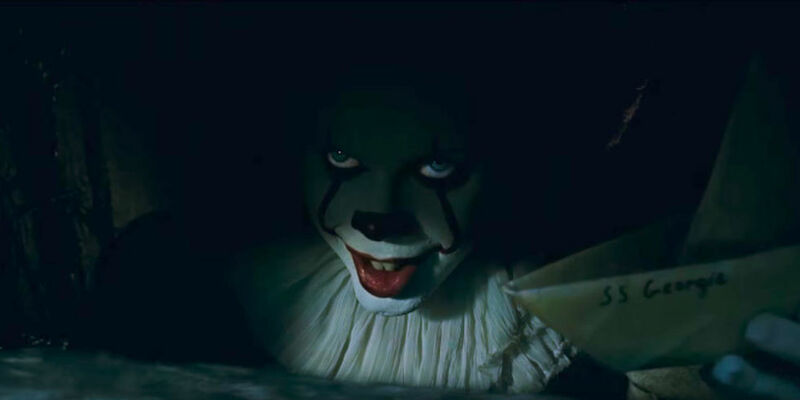 The biggest example is the classic scene where Pennywise attacks and drags Georgie into the sewers with him. In the original, all you see is the clown grab Georgie and then a close up of Pennywise's gaping mouth closing in on its prey. The film recreates this scene shot for shot until the encounter when it improves on it massively. I won't spoil it but the images are truly horrifying and gets the film off to a blistering start. 'IT' is a highly enjoyable film even for those who aren't the biggest horror fans. A great coming of age story with an everlasting creepy feeling is a great combination that provides great entertainment. I wish it was a lot scarier with much less CGI but 'IT' is definitely worth checking out nonetheless. So have you seen 'IT'? If so, what did you think of the film? I hope that this review was useful for if you were planning on seeing the film or not. Once again, thank you for taking the time to read my review, it is much appreciated!